My child confides to a therapist threats and incidents of abuse, that he knew “hiding places in the home should father find out where they live…“ At the time, my two children and I were living in a homeless shelter after being forced to flee our home after the ex, Martin Hegland, assaulted me. During the incident, Martin kicked in the door to the family home, hitting my child in the face with a brass doorknob and causing a black eye. My child bravely spoke up about abuse only to have the family court system rip him out of the arms of the safe, loving mother who tried to protect him and then award SOLE custody to the identified perpetrator of abuse, Martin. At the time of the court order, Martin was a wanted fugitive with charges of drunk and disorderly conduct in another state, where a commitment order was issued against him. He was diagnosed by the court’s own psych eval as having a “personality disorder” and being a “master manipulator”. He had a lengthy history of multiple addictions. And there were over a dozen documented allegations of child abuse, with noticeable trauma in both children that severely affected their development and ability to function. My family has spent over a decade involved in family court litigation, the court itself has become a site for continued abuse. 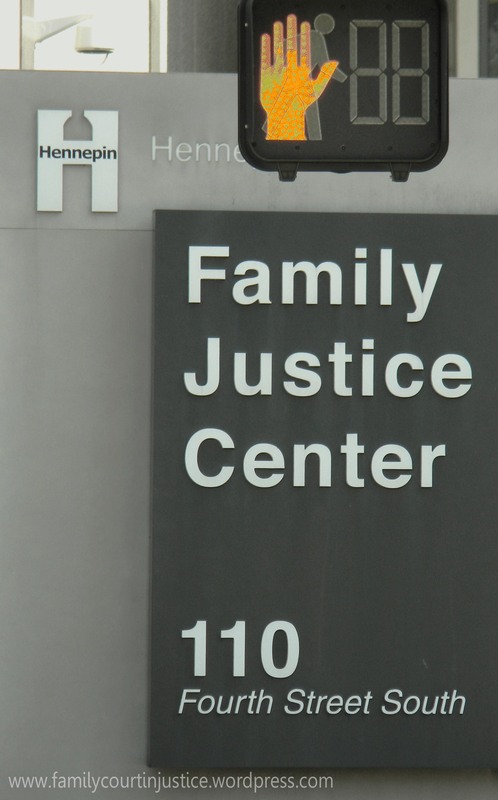 Four judges of the Hennepin County family court system, psychologist Susan DeVries and Guardian ad Litem Jamie Manning will ALL dismissed, ignored or otherwise participated in the cover-up of serious child abuse allegations. When I raised allegations of abuse and sought therapy for my children, I was pressured, threatened and told by family court officials not to talk abuse or report concerns for the safety of my children. GAL Jamie Manning told me that reporting abuse means that I am “unable to co-parent“. I filed a complaint with supporting documentation against Jamie Manning with Laurie Kusek, 4th District GAL Program Manager. Ms. Kusek ignored the complaint in its entirety and refused to respond. I also filed a complaint against Jamie Manning with the judge then presiding on my case, Ivy Bernhardson, who defended Manning and told me that I am “too emotionally attached” to my own children to appreciate the work of Manning. The court system followed through on their threats and I have been forcibly separated from my children, and subjected to a court order that drastically reduces my parenting time to just one visit a month. 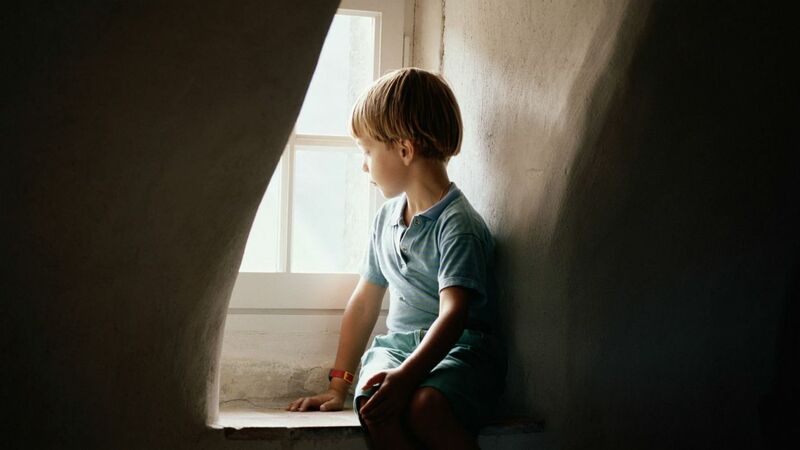 I was once a stay at home mom and primary caregiver, and through the unjust order of the family court have become a stranger in the lives of my children. All of this with no findings of abuse or maltreatment against me. I have submitted professional recommendations attesting my character to the court. I passed the psych eval. I took parenting classes…and yet the most unfit, dysfunctional parent is awarded custody without ever having to prove he is a safe parent. This is Family Court Injustice. 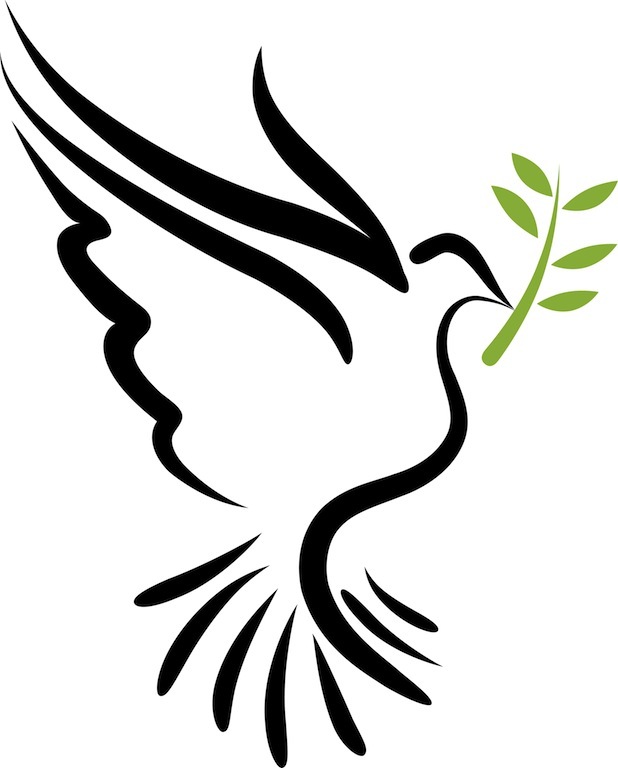 Diagnostic Assessment: ” (Child) was cooperative and separated easily from his mother, who walked with us to the office and stayed several minutes to check in. He immediately focused on trucks play, but was responsive to this examiner’s questions and stopped playing when asked to draw pictures. Answered questions and also spontaneously provided information. (Child) spoke quite a bit about dad and talked about getting “dinosaur spankings” and that dad would “yell like a dinosaur”. He stated he makes threats to hurt others because his dad made similar threats. He acknowledged those threats were scary when dad made them, and is not sure why he now makes them. He stated he would not really hurt anyone. 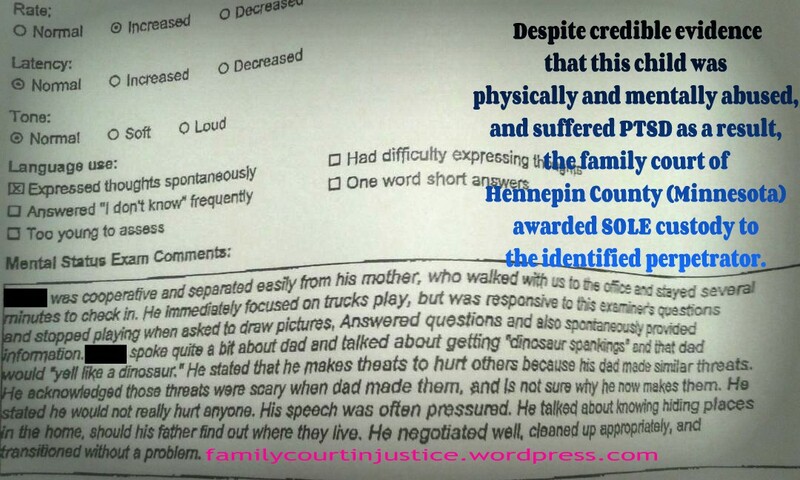 This entry was posted in Abuse Allegations & Documentation, Child Abuse, Family Court Injustice, Jamie Manning Guardian ad Litem and tagged Abuse Allegations, Abuser Awarded Custody, Child Abuse, Domestic Violence, family court, Family Court Ignores Abuse, Hennepin County Family Justice Center, Jamie Manning, Laurie Kusek, Martin Hegland, Minnesota Guardian ad Litem Program, PTSD, PTSD and abuse, PTSD in Children, Tile Artisan. Bookmark the permalink.